The Unlikely Boat Builder: Where are they now? It was 6 months ago that we bid Eric and Fiona farewell. On that day, John and I left behind an adventure of a lifetime. After stepping off Fiona for the last time in Santos, we took a bus to bustling Sao Paulo, and a couple of days later we were back to New York and to our routine lives. Piano lessons were restarted, computer codes were again being written, and we were busy getting ready for the upcoming winter season. Soon, our adventure was a great memory saved in a scrap-book. Of course, for a time we became slightly famous in our little circle of friends -- “Ah! here come the world sailors” -- and we were happy to share our stories and re-live the adventure again, but soon even that faded. Meanwhile, Captain Eric took onboard a new crew and continued his journey towards Antarctica. We followed him and Fiona on Facebook. 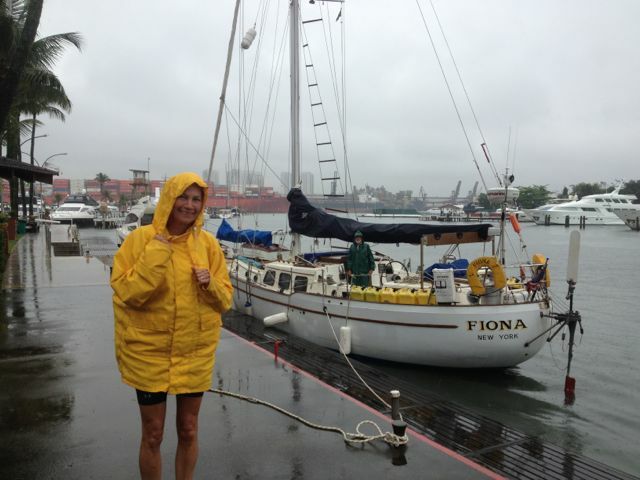 Just like our blog posts, Fiona's came when they came, but when they did, we could catch up on several days adventures. As always, the Captain kept his crew alive and well fed, with the happy hours on time and the good times rolling. It was good to know that the cruise was continuing and all was well on board. Our lives continued on: visits to relatives in Brazil and Florida, piano recitals, preparing the Blue Moon for a new season, laundry folding, phone ringing…. OK, that was a shock. Eric calling us? Why? “He's looking for crew for the Caribbean leg. About a week, April 11 to 18. Saint Martin to Puerto Rico. Only 190 nautical miles, but it will take a long time because he wants to anchor most nights." "Oh, that sounds good. Let's go!" Pffff, here we go again. John and I were going to take off that week anyway. I had tickets to spend Easter with my family in Brazil, and John had plans to visit his mother in Florida. Sooooo, after we thought hard and long (actually, I thought for about 3 minutes, and the more cautious John for about 2 hours) about Eric’s proposition, we called him back and signed up for the leg. If a chance comes your way and you think you might , maybe, just a tiny little bit, manage it, then go for it. Time and tide waits for no man or woman and chances just might not come again. Looking forward to hearing of your next round of travels.